It's Spring, flowers are blooming everywhere! 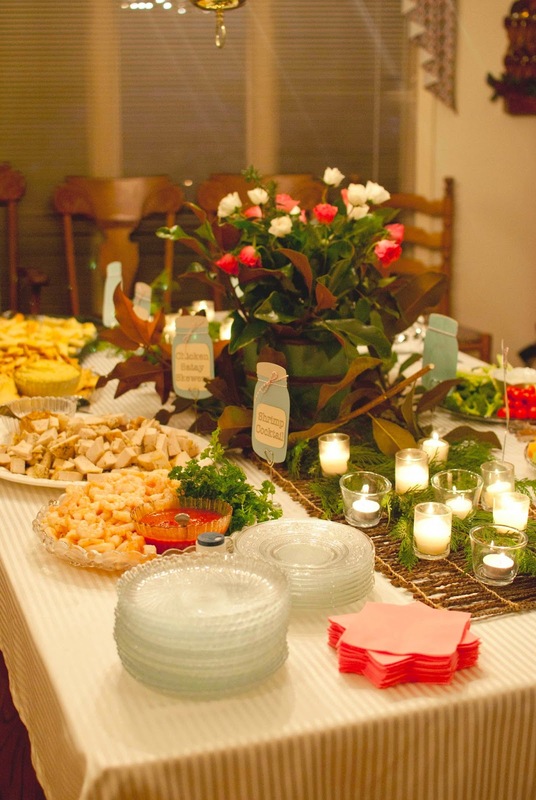 Here are 8 tips I have for you about flower arranging. I am not a florist, so these are my own opinions. I am very opinionated about flowers, as well as a lot of things... Have you noticed?! Here in Asheville we have a fabulous luxury of Your Vase or Mine. A sweet lady grows flowers in her garden, you order by the bucket full, and she cuts them for you. Then, I arrange them however I want! LOVE. These are the product of that service. I did add yellow roses that I purchased from the store. 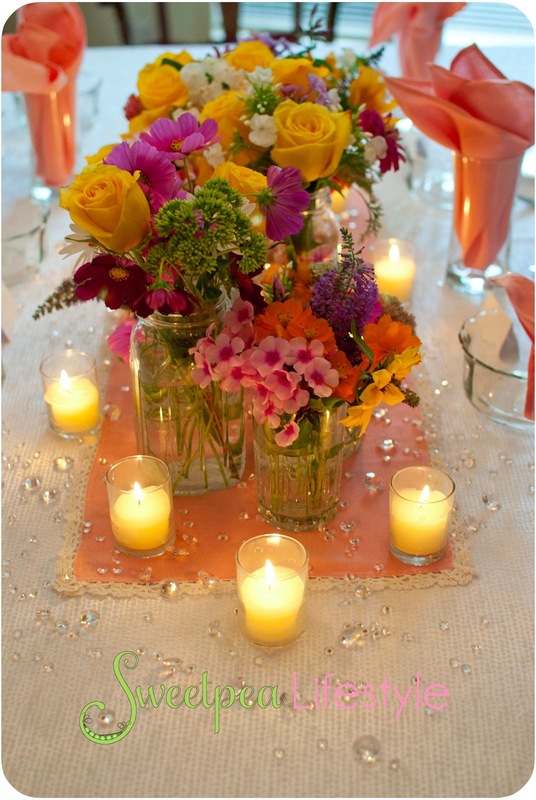 I used everyday drinking glasses and mason jars as the vases, with different heights. 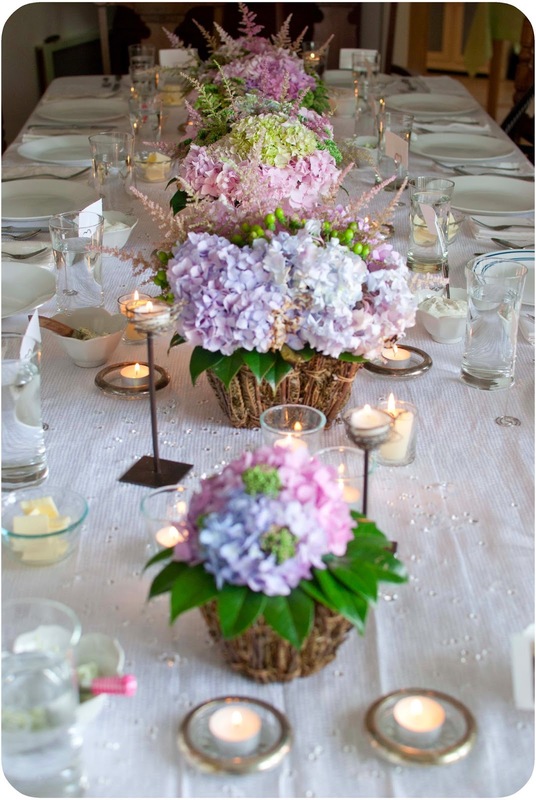 Using height allows for an eye appealing depth with your floral arrangement. 1. Never arrange flowers higher than your mouth. You want to be sure to see the person across from you, not strain your neck around some large arrangement. 2. When cutting fresh flowers, either cut early in the morning or late in the evening. Flowers are like people, they stress very easily when moved to new surroundings. 3. Flowers like Lemon-Lime Soda. Not a lot, just a tinge in the vase mixed with room temperature water. 4. Flowers also like to resemble being in the garden. Not too close together, and not too far. 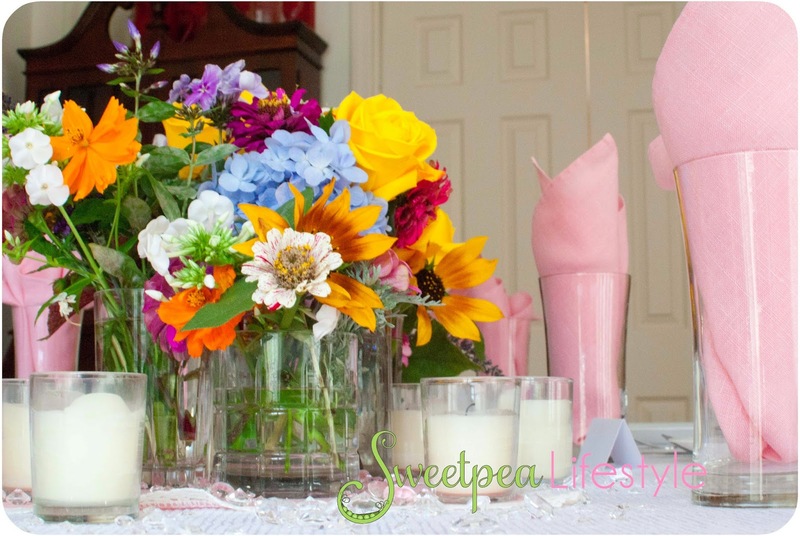 These lovely arrangements were used for a sweet girl's wedding. 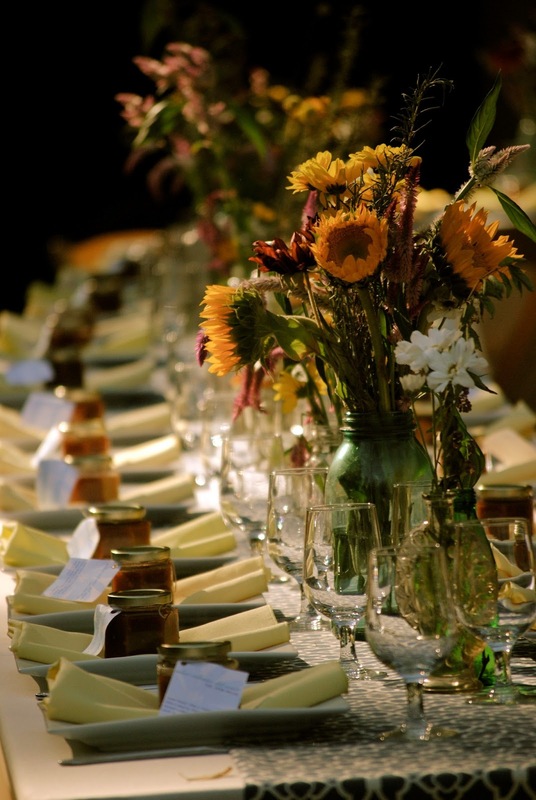 Larger vases filled with sunflowers, wild flowers, and fresh rosemary were placed between people's places. Lower arrangements were used as fillers. 5. Use long lines. Keeping a fluid line is appealing for the human eye. 6. Use nature. Twigs, branches, greenery. Use those coniferous trees and bushes! 7. When using a wide vase, add tape (I like to use masking tape. But, floral or plain old Scotch tape work great!) in a criss cross manner. 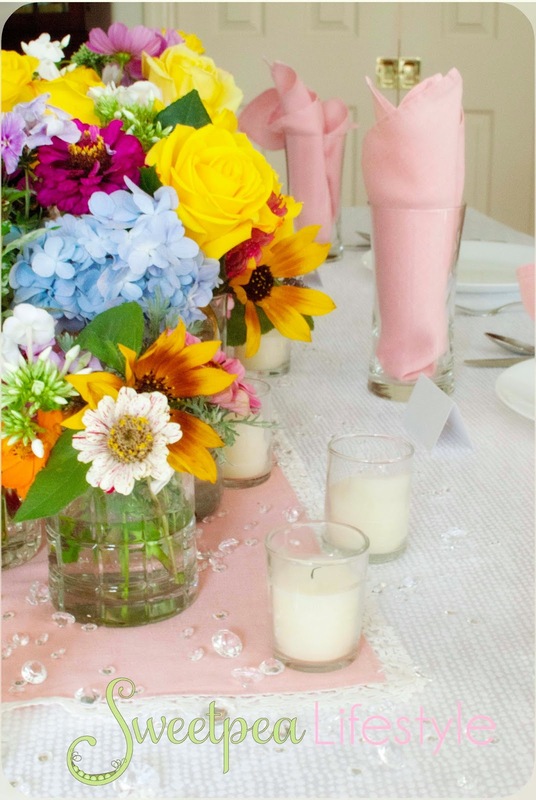 Place your stems in between the tape pieces, allowing your flowers to have a "net" to hold them properly. 8. Trim the stems everyday, and change the water. Your flowers will thank you, and will stay around much longer. What flower tips and tricks do you have?? 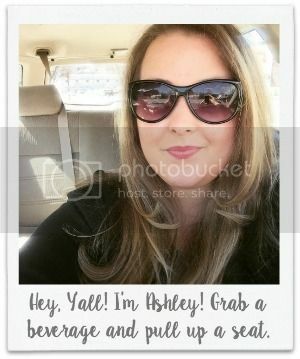 I would love for you to share! Need to catch up?? Here is a recap so far..